It had been 100 years sinse Alfa had seen the light of day, and by some unknown force, he was awakened on this day. He could feel the ebb of time slowly reversing. Knowing that the curse that been placed upon him, time really had no effect upon him as if he were someone watching life go by from a window. Alfa knew that this strange reversal of time could not have been caused by man. for no man had ever learned the deepest secrets of the elven arts of magic nor the tounge of the most ancient of beings known as dragons. knowing that this event needed further looking into, Alfa raised from his sleep chamber and slowly stepped into his weapons room. As he opened the door, a small glint of light fell upon a medium sized oak table that sat in the exact middle of the room. The light glissened off his most prized possessions, the demascus forged katana and his array of onyx daggers. Slowly he began to walk over to the table as the flood of memories came rushing back. As he came to the Table, his hands trembled as he placed his right hand upon the hilt of his katana. Then, like the well trained warrior that he was, he equiped his tools of his most feared trade like it was second nature. After dawning his deadly razor sharp tools, he stepped out of the room and proceeded towards the outside door. Upon stepping outside, he could sense that things had changed drasticlly. His mind began to wander off to the only Elf that he had ever befriended Cirdain Carnisor. was he still alive? or had someone taken the life of his only friend? With this thought, a feeling of rage came about him and he quickened his steps away from his lonely little cabin in the woods. Alfa, started to make his way through the woods almost in a northerly direction, knowing that was the direction he needed to travel to make his way towards Sionnadell the last known home of Cirdan and unfortunately Elros. Alfa began to feel a twing of regret towards what he had done so many centuries ago to Elros and hoped that he could express his regrets to Elros without further confrontations, but, Alfa would not run away if Elros desided to make any hostile gestures. 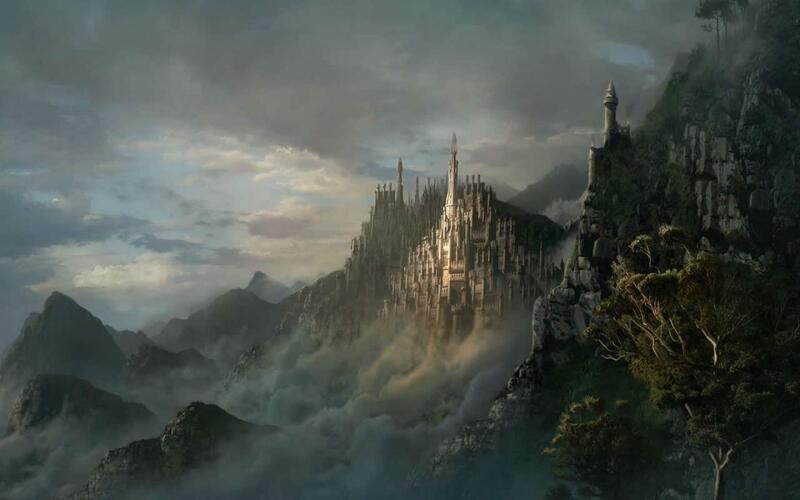 As the day wore on, Alfa finally came upon A rather large kingdom where he had last known Cirdain to reside. sensing some elven magic protecting the kingdom, Alfa waited just inside the forest tree-line knowing that someone would be able to sense his presence. A leaf drifted down to tumble tip over stem from the boughs above. Rich green, dabbled with gold and amber fluttered and danced in the light breeze in the spring air. A flicker of red and gold might be noticeable in the branches above, long limbs and graceful angles of distinctly elven features sheathed in simple leather and spun linens. Twigs broke beneath her grasp, as Bae leaned over the limb to get a better look at the one with such dark aura about him, she could not see him clearly through the tree branches, but the glimmer of fire and simmering coals in the swath of black aura was clear enough for the dragon disciple to pick up without serious perception. The elf carefully picked her way down through the treetop, limb after limb she climbed down with swift grace and waited as she kept observant gaze upon the dark being. Was he someone she knew? Was he someone she recognized? Her expression remained blank, those angular features introspective of the being as much as she was curious of him. Rich red and gold tumbled about her shoulders in spiraled curls, tangled crisp coils springing out in wild frizz to frame about a softly tanned face. No scars, no wrinkles, nothing to betray age, or experience....but if one were to meet her gaze, untold ages had been witnessed through those eyes, the rise and fall of kingdoms, and the crippling fates of mortal and immortal alike. The soft curve of her lips gave part as she examined the new-comer with much interest, in spite of her lack of expressive gesture, her head canted to the side, and the tell-tale point of her ear protruded from the cloud of red, gold and rich amber hues of her curly hair. If one were to draw closer than where she currently stood, the air would fairly crackle with heat, the scent of smoke or ash may cling to the senses, maybe even a hint of sandalwood, but from where she rested on the lowest hung branch, it may not be picked up right away. A change in her expression however, turned from the blank introspect, to that of one with much patience, and perhaps a wary almost shy nature. The faint curl of her dusk rose lips turned up as a low murmured greeting was offered. "A long way thou hast traveled, stranger, whence thy feet tread bares witness to days none shall see again. Whom might ye be traveler, and whence hast thou come?" confided in. With the day growing longer, and the sun falling upon the splender of the forrest with its many beauties, animals rushing around the forrest floor gathering food and the uninvited elf that sat in the branches above him. Not wanting to cause the new company to become defensive, Alfa didn't make any sign of taking notice of this elf, but her questions rang in his mind like a large bell sounding an alarm. Why had he come? Was it because he had hoped that his long time friend Cirdain would be here? The thought kept spiraling through his mind endlessly like an unending amusement ride. and, the two names that kept going through his mind were his friend Cirdain and Esmeredan one of the oldest living dragons in all creation. Alfa had met this ancient of dragons through a dark elf he had known from Linesia a dark elf that had long forsaken his races god and was chased out of his peoples land to live in the upper worlds with the other races of elven kind. suddenly, Alfa's thoughts were brought back to the here and now by the unexpected scent of sandallwood. Without thinking, he began to answer the soft questions of his uninvited onlooker in the branches above him.
" I am Alfa Von Crouix former heir to the Von Crouix estate and one of the most feared assassins in what once was known as Linesia. I have traveled many miles and many days just to find someone from my past." As Alfa sat there awaiting a response to his actions, he placed his left hand upon the hilt of one of his onyx daggers. Even though he didnt really wanna use any offensive actions upon such a creature as an Elf, he didnt really know how else to act sinse most people and races reacted the same way towards his kind. While he waited for some kind of responce, he gave out a loud cry " Cirdain.... I seek Cirdain Carnisor !! " With the cry Alfa gave, Baesonna dropped from the limb and stood to her feet. Those old eyes looked him over as she pressed a finger to her lips in a hushing gesture. No, on the forests-edge there was no need to be so loud, after all griffons liked to hunt the edge quite often and she was most certainly not going to tarry long around one that bellows for his own death. "I know of whom ye seek, he lives within the palace. Land has sundered and been restored by the hand of dragons yet the spirits still cry in mourning. Some have not returned yet, but these ears hear long and far..." Her lips twisted in an impish grin as she turned her back to him, gesturing for him to follow. "A dragon once spoke that name that thou call thyself. She sleeps deeply, many have tried to wake her but to no avail." Those strange molten red and gold eyes glanced over her shoulder at the assassin. "I expect I can trust one that the Crystal had spoken of to not stab me in the back, aye?" She seemed hesitant...her hands resting at her sides, the strong crossbow resting at her belt within fingers reach. Cirdan soon appeared before the forest as he re – oriented himself , gripping the hilt of Stormbringer upon his right hand it seemed to have ash dripping down off the blade as it murmured softly upon his touch; with affection. The energy around Cirdan seemed to pulse, his power seeming to have intensified. His sky blue eyes flaring with an inner flame as they stared upon the two speaking. He recognized the male as he licked his lips he tasted the power of his sword almost venom like. He knelt down silently his eyes gazing at the man known as Alfa, his long white hair flown down over his shoulders his sword still upon his hands. He walked over to the two people from his past,eyeing them with suspicion a doubting look upon his features ‘’ So I see you both have returned….’’ He seemed at ease as he walked casually to the pair ‘’ I knew I sensed something different within the air around me, I felt the powers returning…old ones coming back. ‘’ he eyes Alfa for a moment as he passed by him, he never forgotten the times before Siannodel, how they ambushed him and he was prepared incase such an event was evident. He smiles at them both ‘’ What brings you here Alfa? ‘’ he asks calmly as he leans against a tree not too far off. Calmly, Alfa looked at the only person he had considered a friend. Now considering the questions posed to him from the Elf. " My friend, it has been almost 175 years sinse we last spoke. after the fall of our once glorious home ( Linesia ) i desided to return to my humble abode in the Dark Woods. i meditated upon my past and desided to go back into my long slumber." recalling events began to bring a rush of emotions upon him. He stayed silent for a few seconds and began to speak again. " I see your trusty StormBringer has not left your side, it is good to know you have kept it safe all these years knowing that many people have attempted to discover the where abouts of that Legendary weapon." now looking directly into Cirdains eyes, "I was awoken by some force that seems to have reversed time. and in all my years, only two races have i known ever had the knowlege of such spells are Elves and Dragons." now looking at the what appeared to be a young elf, Alfa stated " unfortunately, the only dragon i've ever known to possess such knowlege is still slumbering"
Now knowing that two of his oldest known aquantances had seemed to come out of his mouth, he had not dared to mention the only person who had ever given him hostility regardless of his intentions, but he was not about to openly mention Hooded John out of some unlikely event that the son of Satan himself might appear and bring back emotions of anger and hatred that he had long sinse put in the past. Once again, Alfa looked at the elven warrior/wizard he could feel his left hand slowly moving away from the onyx dagger he had placed his hand upon when the younger elf appeared. He didn't know why but he felt an air of comfort knowing that Cirdain was still alive and safe. With a half hesitant smile, he asked Cirdain one simple question " What of Elros? does he still live? if so, i must make ammends to Elros for my evil deeds from so many centuries ago"
Thinking of these deeds which he commited against Elros, he could feel the emotions of sorrow welling up inside him. He took his right hand and placed it against his chest feeling the locket that had once belonged to Elros' long sinse passed wife Songliancha. Then without knowing why, he pulled out the locket, ripped it off from around his kneck and let it fall at Cirdains feet. As he looked up at his only friend, tears began to well up in his eyes. " please give this to Elros. I don't think it would be wise if he is still alive that we meet face to face right now." Then as the day began to lengthen, Alfa stepped away from the two elves " pardon my leave but with your permission Cirdain I would like to enter the city so that i might attain some work and some coin to support myself." As he stepped towards the gates of the city, he stopped some twenty feet from the gates knowing that an elven city permitted no one without elven permission. The dragon disciple remained silent, observing the exchange with her hands falling to rest comfortably upon her hips. Those fiery eyes flicked from Alfa towards Cirdan as he had approached and bowed her head in dignified respect to the former emperor and stepped away from the pair, feeling as though she were intruding on something that she was uninformed of and gave them distance. Every now and then she glanced back to check to see if they were still speaking, but remained at the distance she kept, her back pressing to the great oak trunk as she returned her watchful gaze to scan the skies in the growing dark of the coming duskfall. Searching for something, though she made no attempt to communicate to either what, or even of her personal thoughts. It was clear she felt the outsider, in spite of having been within the king's lands long enough to know it like the back of her own hand. There was a tense manner in her step as she pushed away from the tree and strode in silence from the pair, if they follow, they follow, but she had other matters to attend to within the city....and someone she needed to find if the old dragon dared to awaken again... soft sigh rushing from those plush lips as she shook her head to dismiss her own misgivings on her old teachers situation. Time will tell...and she had no doubt that it may be a while before she would be able to speak with the elder dragon and her brood. Cirdan glanced up a the two as he entered soon after his body shifted some he wore leather boots, and black suite of armor his body well-toned in the ways of fighting, and his mind was well disciplined in the ways of sorcery. He gripped the hilt of Stormbringer upon his frail hands as his blue eyes gazed particular upon Alfa after the female that was there walked away some to give them space. He listened to what he had to say, Cirdan did not say a word to the man before him. There was a sense of shock in him perhaps that he was even alive still.He eyed the women as he observed her up and down taking her in for a moment; however he turned back to the man before him and as he spoke he tossed the picture down before him near his feet, he moved to pick it up carefully, his eyes never leaving him as he retrieved the item and as he spoke of his father he picked up the item and saw a picture of his dead mother, he seem to grasp the necklace upon his hands enough to where it turned red as he clenched it in silent anger. He seemed a bit calm and relaxed as he crossed his arms over his chest ‘’ As far as this necklace goes I will keep it for myself, In consideration he has moved on with his life and he has defeated whatever demons held upon his shoulders. Somewhere nearby Thasrissian, the ancient Aspect of Reality stood observing the conversation. Normally his dragon form would have given away his presence despite the wards he used to shroud his aura from being noticed. Difficult for a colossal dragon to simply stand in a forest and not be seen, even with the wards his hight would have given him away had it not been for the large trees he melded into the shadows next to. His scales colored as they were would blend him in further to the point only one familiar with the forest itself would be able to spot him with their trained eye. For the time being the Gray Dragon was content to watch and listen to what was going on, well aware that despite his attempts to dissuade Cirdan from taking up Stormbringer again his old friend had managed to do so. It saddened the dragon a bit knowing the inevitable events that had been put into motion now. There was little he could do but watch and try to mend or prevent what damage may come from it if any. It wasn't that he didn't trust Cirdan, more that it was that he didn't trust that foul sentient sword. Ever since the ancient dragon had learned of that sword he had watched what it brought about, swearing to himself that he would find a way to rid the world of it for good. For time that had really happened and could have remained that way had it not been for the rift which nearly destroyed everything. Thas shook his head slightly recalling the horrid event in a clarity only one such as himself would be known for. In truth he was still living through it, just as he continued to live through all events he had taken apart in up to the present day. The keeping of time was part of his aspect as much as maintaining the planar boundaries and keeping the realm of chaos in check. Keeping Cirdan from taking up the Stormbringer again was perhaps his only true failure at this point. While he probably could overwhelm the elf and send that foul sword to the ends of the multiverse, he could never do that to his friend despite all the things he knew would happen. Fate had won her right to do with Cirdan as she would for once. Sometimes she was cruel, though the Dragon wondered if it was more to punish him for his meddling and less to pass judgment on the elf.